This article on Labrador puppy training tips will hopefully be a useful guide to help your lab become keen and biddable, with a kindly nature and no traces of aggression or shyness. Labrador Retriever training will help your Lab develop physically and mentally as well as enjoying more freedom. Training your puppy will also be a constant source of fun and pleasure for you and your family. A good programme of Labrador puppy training can eradicate unwanted behaviour in your pet, such as chewing, biting, whining ,barking, aggression and digging. These are instinctive behaviour patterns in the animal and but are traits which will not emerge if your lab is kept occupied and regularly trained. Aggressive behaviour in your Lab, which includes biting barking and snarling, can be eradicated by making sure that is it is safe and feels secure. Barking may not necessarily indicate that theLabrador Retriever is distressed, but constant barking will have to be addressed; for your own sanity if nothing else. As with dog whining, one way of changing your Lab's behaviour patterns is by providing him with daily play, exercise and training. However, it is important to remember to play with your Labrador only when he is quiet. If you do spoil him when he appears agitated, he will always whine when he wants your attention and realise, that as far as you are concerned, that whining is acceptable. 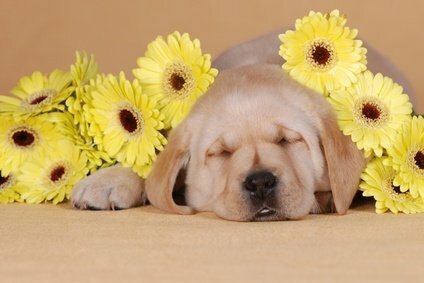 Another valuable Labrador puppy training tip is to try and modify negative behaviour. It is essential that you undertake this while the Lab is still a puppy. It is never too early to start training your Labrador Retriever. Labrador Retriever training methods should be based on the fact that Labs are renowned as an intelligent breed who are eager to please .Labradors are renowned as a very trainable breed, right from being puppies to adulthood. It is very important that training begins as early as possible. In embarking on a training programme it is important to realise that these dogs grow into powerful, excitable adults. So, when first embarking on a Labrador training programme, it is important to begin with some basic obedience and to help the puppy to learn to socialise with both people and animals. Good Labrador puppy training should see the puppy taught short, one word commands such as "sit", "down", "stay" and "heel." When the Lab obeys, he should be given fulsome praise.A good programme of Labrador puppy trainingcan eradicate unwanted behaviour in your pet, such as chewing, biting, whining ,barking, aggression and digging. These are instinctive behaviour patterns in the animal and but are traits which will not emerge if your lab is kept occupied and regularly trained. Good Labrador puppy training should see the puppy taught short, one word commands such as "sit", "down", "stay" and "heel." When the Lab obeys, he should be given fulsome praise. Labradors are very lively dogs and as their training develops they should be taught not to jump on people. One method to help achieve this is to have dog walking on a loose leash. On beginning training the dog as a pup, the Lab should become used to wearing the collar. Thisis further developed as the animal is introduced to a leash or lead, though at first it should be light to enable him to become used to it. The early leash training can be embarked on at first by just walking around the house. When carrying out this activity if the Lab should try and strain at the leash, his handler should stop and call him back. The Labrador should never be pulled back. This discipline will be good training for your Labrador Retriever as he grows older. Having being taught never to pull ahead on the leash as a pup, the dog is less likely to indulge in that behaviour as an adult. When Labrador puppy training it is always important to focus on demonstrating to him the kind of behaviour you expect such as him walking by or behind you rather than pulling on his leash. Good behaviour should always be rewarded, and when your Labrador stops when you come to a halt give him a tasty treat. This work with the leash as part of your Labrador Retriever training is very important. The amount of time this type of training takes varies from Labrador to Labrador. However, the earlier you start training your puppy, the better the results will be. Your Labrador Retriever needs to learn discipline and obedience from a very early age but, when he does obey you, you should be fulsome in your praise. This will mean a lot of repetition in the forms of commands, training and teaching from you the owner, but the more you indulge in giving simple commands, the quicker your Lab will respond and learn. Good training can help you avoid the misery of having a dog which relieves itself in undesirable places, fails to respond to basic commands, behaving in a stubborn or undesirable manner and engages in excessive biting. A side product of such undesirable behaviour are skin ailments as well as other health problems. Sound and regular training will help produce a Lab which responds correctly to all your commands, acts obediently and looks forward to play and training sessions, does not indulge in excessive barking and howling, and shows no sign no sign of aggression or stubbornness. Instead your Labrador puppy will be a healthy, happy and active animal ready to join in all the fun with you and your family.